Today, February 8th, we inform you of Kakegawa Kachoen Girl's Day Festival that will be held on March the 3rd. 2월8일 오늘은 3월3일의 히나마쯔리에 진행되는 히나마쯔리히벤트를 소개드리겠습니다. The festival mainly consists of provision of special dishes in the Buffet Restaurant and sale of special snack at special price in the Cafeteria. Details are still secret, we are looking forward to see what kind of foods will be served. 이벤트의 주요내용은 바이킹레스토랑에서는 히나마쯔리특별메뉴를,음료수코너에서는 히나마쯔리특별과자를 싼 가격으로 판매합니다.구체적인 내용은 아직 잘 몰라 그날 어떤 메뉴랑 과자가 나올까 기대하고 있는 중입니다. Additionally, first 200 visitors will have a cup of Amazake drink. The Amazake is, instead ready-made one, brewed with Koji yeast in the Garden. It is quite interesting to see how it will taste. 그외에도 화조원을 찾아주신 200명의 손님에게 아마사케(감주)서비스도 제공됩니다. 이 아마사케는 슈퍼에서 판매되는 것이 아니라 당원에서 누룩으로 만든 감주입니다.이것도 무슨 맛일지 아주 기대되네요. 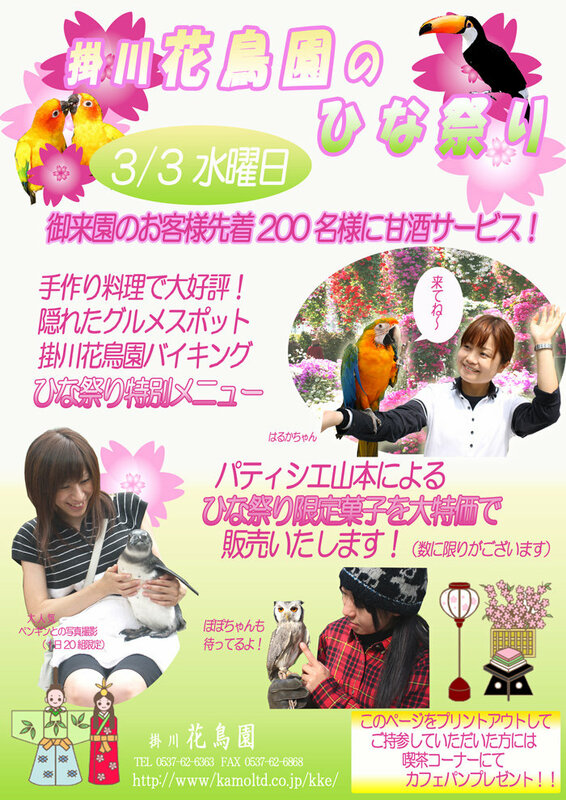 Though March the 3rd is a weekday this year, we hope many convenient visitors will visit the Garden. And, we will make much efforts to keep visitors more and more entertained through such small events. We sincerely beg your kindest cooperation. 올해의 3월3일은 평일이지만 시간이 있으신 분은 와주셨으면 감사하겠습니다.그리고 이후에도 여러가지 이벤트를 만들려고 노력하고 있는 중입니다.잘 부탁드립니다.